Kicking off on 5th January 2019, our Brilliant New Year Special tour takes you on a journey through Northern Ethiopia, from the Simien Mountains to the castles of Gondar, all in the company of like-minded travellers. What's more, you'll get to experience Ethiopian Christmas in Lalibela, one of the most extraordinary celebrations on the Ethiopian calendar. 9th January 2019: Simien Mountains National Park – Gondar – Debark to Sankaber (3,200m) 2-3 hours / 7km. 10th January 2019: Simien Mountains National Park – Sankaber (3,200 m) – Geech (3,600m). 7-8 hours / 15km. 11th January 2019: Simien Mountains National Park – Geech (3,600m) – Inayte (4,070m) – Cheneck (3,600m) - 7 hours, 15km. Camp nights in the Simiens make for fantastic memories, 3000m high around a bonfire, surrounded by once in a lifetime views. Today you’ll reach the highest point of the trek so far. The day will start with a gentle trek up the Buhait pass before the trail steepens. The climb will test but reward you, with the jagged and steep terrain giving way to striking views once you reach the summit. As with the other areas, wildlife is plentiful here and people have spotted the elusive Ethiopian Wolf as well as Ibex, monkeys and an array of bird life. In the morning, drive (~2.5 hours) to the incredible Limalimo Lodge. This is one of the few luxury lodges found in Ethiopia, and it's as idyllic as the pictures suggest. Spend the day relaxing around the lodge, with optional walks in and around the park. Enjoy a deserved rest without having to forfeit on any views, kick back on the terrace with your tipple of choice and watch the sun set over the mountains - this really is the perfect way to bring your adventure in the Simien Mountains to an end. 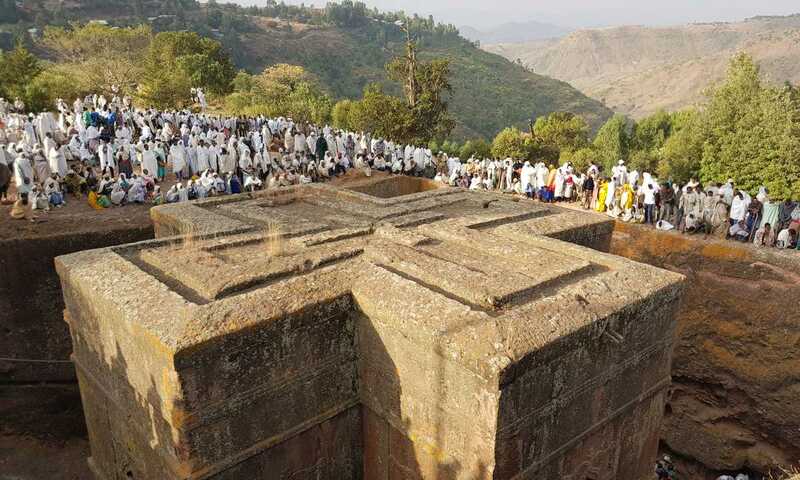 After breakfast at Limalimo, drive for around 4 hours to Axum, Ethiopia’s most religious city which is home to an impressive display of Obelisks that rise dozens of metres into the air. The city is is rich in history and our Brilliant guides will help you understand the significance of where you are. The city is purported to have been the home of the Queen of Sheba. Rumour has it that the lost Arc of the Covenant is in the Church of St Mary of Zion. A short walk through the cobbled streets brings you to the stelae fields and some of these impressive 4th century AD granite structures rise to over 23 metres. 15th and 16th January 2019: Gheralta Lodge, Addis Ababa, and Home. Spend the morning exploring any remaining sites in Axum before driving to Gheralta Lodge. Overnight in Gheralta Lodge. In the morning, head to Mekele airport and visit two fantastic churches en route. Fly to Addis Ababa where your Ethiopian adventure will draw to a close. Be sure to squeeze in a coffee and some market walks before you head home. Tours of Addis, whether to markets and or food tours are well worth it and can be arranged. Enjoy a final night’s comfort in one of the better hotels in Addis. This trip can run as a group trip, with prices starting from $1,972 per person for a complete group. If you are looking to join a group or you are a solo traveller we will help to form likeminded groups of travellers. Please let us know your travel plans.